Intense competition, such was the order of the day on Tuesday 15th January as the two day qualification tournament for places in the Seamaster 2019 ITTF World Tour Hungarian Open commenced in Budapest. There was no place for the faint hearted. Striving for a place in the main draw, former champions progressed but one former champion fell. …………Austria’s Daniel Habesohn and China’s Yan An, the respective winners in 2014 and 2017 kept their hopes of a main draw place alive but there was defeat for Hong Kong’s Jiang Tianyi, the 2015 champion; he was soundly beaten by Spain’s Carlos Machado in the second preliminary round (11-7, 13-11, 11-8, 11-8). …………Brazil’s Gustavo Tsuboi won the match of the day; in the second preliminary round he ended the hopes of Romanian teenager, Cristian Pletea in a seven games contest that lasted an incredible 80 minutes (11-4, 11-6, 8-11, 12-10, 10-12, 10-12, 11-8). …………The knowledge of Jörgen Persson was appreciated by Truls Moregard, the 16 year old Swede beat both Bulgaria’s Philipp Floritz (5-11, 5-11, 13-11, 11-6, 11-9, 11-6) and Slovakia’s Lubomir Pistej (11-7, 10-12, 11-7, 13-11, 11-8) to keep his goal of a main draw place alive. 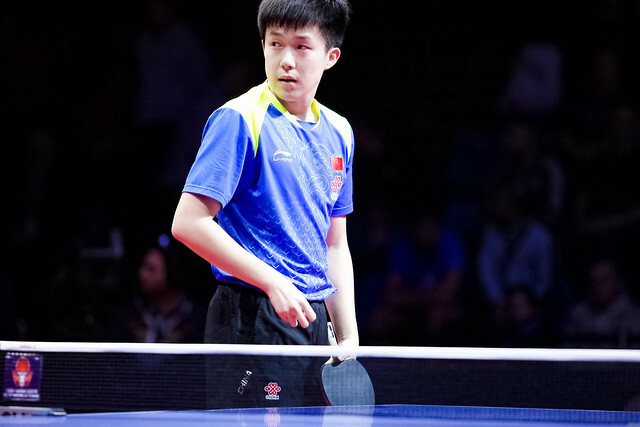 There was defeat for Zheng Peifeng, the surprise winner last year at the Seamaster 2018 Czech Open; he suffered at the hands of Chinese national team colleague, Xu Yingbin, a boys’ singles quarter-finalist at the 2018 World Junior Championships. …………In the men’s singles event there mixed fortunes for India, both Sharath Kamal Achanta and Sathiyan Gnanasekaran experienced defeats; conversely Harmeet Desai and Amalraj Anthony progressed. Sharath Kamal Achanta lost to Sweden’s Pär Gerell (7-11, 11-4, 12-10, 12-10, 4-11, 11-8); Sathiyan Gnanasekaran suffered at the hands of Serbia’s Zsolt Peto (9-11, 11-8, 11-7, 11-8, 8-11, 11-6). …………Winner in 2014, Austria’s Liu Jia made a successful start in the women’s singles event, in her opening contest she beat Sweden’s Filippa Bergand (11-1, 14-12, 11-9, 9-11, 11-9). …………Romania’s Adina Diaconu shone in the women’s singles opening preliminary round; she beat Hong Kong’s Ng Wing Nam (12-10, 11-6, 6-11, 11-5, 11-8). …………The men fell by the wayside but Szandra Pergel flew the flag for the host nation; in the opening preliminary round of the women’s singles competition, she beat Alkaterini Toliou of Greece (11-5, 10-12, 11-8, 11-5, 11-5). …………Holding the nerve and resisting a spirited recovery, the vote goes to Croatia’s Mateja Jeger. She won the first three games against Germany’s Wan Yuan, lost next three, before prevailing by the narrowest of margins in the decider (11-9, 11-8, 11-9, 9-11, 8-11, 7-11, 12-10). …………Alas for Austria’s Robert Gardos who celebrates his 40th birthday on Wednesday 16th January, there were no presents. In the second preliminary round of the men’s singles event, he was beaten by Croatia’s Frane Kojic (11-6, 8-11, 11-6, 11-7, 11-8).